As the primary space for most of your recreational activities, the living room has evolved to become a room designed for a wide range of lifestyles. This modern mecca can be complex, tailoring to every member of the family throughout the week. As such, it’s important to ensure that your indoor lighting fixtures are balanced and beautiful to provide safety and comfort for all hours of the day. Nebraska citizens in need of quality home lighting fixtures and expert advice have turned to The Light Palace since 1953. Our stocked and friendly lighting store in Omaha is here and ready to provide a wide range of services to customers in need, from DIYers to commercial contractors. We understand the importance of balance in your living room lighting scheme, which is why we’ll conclude our look at some basic tips to illuminate your space based on your primary design goals. If you’re in need of assistance in finding modern lighting solutions for your home, be sure to stop by our expansive 10,000 square foot lighting showroom to find the best lighting and window design assistance! Ambient lighting is essential for setting the mood of your living room. As a dynamic space, this room is often among the largest in the home, affording you more space to input floor lamps, wall lights, and ceiling mounts to properly light every corner. While we love to customize your residential lighting plan to entertain hosts, it’s important to remember that too many lumens can wash out the space and ruin your relaxing atmosphere! Task lighting will not be a top priority for social hosts, but that doesn’t mean you should move on entirely. A corner area for a reading lamp or sconce can provide extra illumination if guests need to read, write, play board games, or so on. Accent lighting can prove very fun and beneficial for your unique space. These focused lighting options can create drama and depth where needed to start a conversation on your home design skills. If you have a nice piece of artwork, a unique archway, or maybe a rustic fireplace, accent lighting can be used to great success. Again, be careful not to overdo it! While we have listed three primary goals that you may have in mind when planning your living room lighting scheme, it’s important to remember that this is your family’s personal space. The Light Palace is here to provide personalized solutions to help you because we want you to be comfortable at home. If you want to do none of the activities we listed or all of them and more, remember to plan a balanced home lighting plan that is beautiful and cost-effective. Don’t plan your space for anything unless it makes you happy. If you are struggling to find the right level of light for your varying activities, dimmer switches are always a smart option! 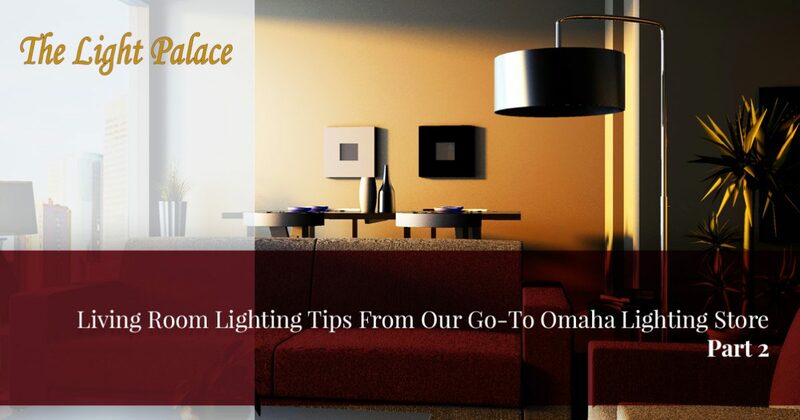 For decades, our lighting store in Omaha has worked to provide the best solutions for all of our happy customers. The Light Palace is invested in your success, providing a wide range of home design solutions to help you get the job done right. We offer complete design solutions for projects of all sizes. Contact us today or stop by our lighting showroom to begin!